Big Sur Marathon Training- Week 12 and 13 | Fit Girl. Happy Girl. I’ve been in full taper mode and with last week being so busy for work with the Boston Marathon, and then the bombings, and then the follow-up, I haven’t had time to write up my workouts from the past two weeks. Also, because we were very busy traveling, I missed one of my runs which really bummed me out. But, I was assured by my coworkers that it wasn’t a big deal and I am more than ready for Big Sur this weekend. It may be the taper crazies talking, but I really hope they’re right! I also did Oiselle’s dirty dozen core workout. Wednesday: 5.32 miles in 44:36 at 8:23/mile pace. This run was just not working for me. It was so hot when I went out for my lunch run I just didn’t feel good the entire time. I was supposed to run 6 miles but I didn’t have it in me to complete the run, I needed water asap. I think I’m just not used to the heat yet and thankfully it’s not going to stay this hot for too much longer. Thursday: 8 miles in 1:13:00 at 9:06/mile pace. Saturday: I was too busy with work to get my long run in so that didn’t happen. Womp womp. 2-mile warm-up: Meghan and I did a quick warmup run before today’s B.A.A. Boston Marathon 5K. Ran around and did some strides. 3.1 miles in 25:23 at 8:11/mile pace. This morning I ran the B.A.A. Boston Marathon 5K and set a 2-minute PR! I had kind of high hopes for this race because I knew it was going to be a fast, flat course. It was super crowded which made it kind of hard to maneuver around people but overall it was a great race! Wednesday: 6.5 miles in 59:00 at 9:06/mile pace. Saturday: 10 miles, long, slow distance in 1:30:43 at 9:04/mile pace. It’s bittersweet but this was my last long run of Big Sur training. I can’t believe I’m running a marathon in a week!! Sunday: 3.32-mile recovery run in 28:55 at 8:45/mile pace. Easy shakeout run today around the neighborhood. I wanted to do 4 miles but I had some blisters in the making that were killing me. Horray for taper week! You are so close! Can’t wait to hear how it goes!! Woo! Taper, taper! And you’ll be sooo ready for Big Sur. It’s beautiful, so when it hurts, just breathe in the beauty of the world around it. I have a lot of friends who have done it, and the hills can hurt you (but you sound totally ready, running hills left and right), but it’s so worth it for the beauty! :) GOOOD LUUUCKKK! How exciting! 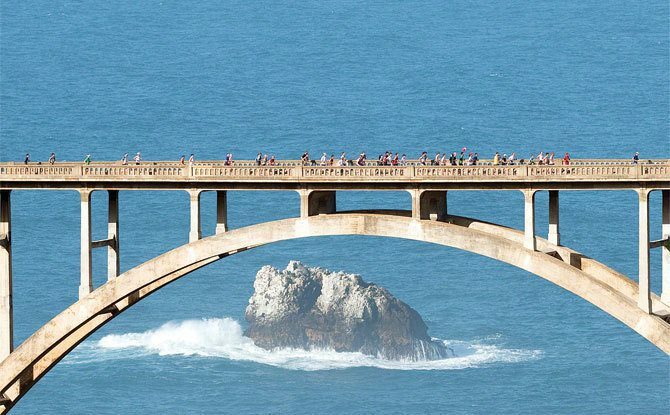 You’ll do so good in that marathon and what a beautiful scenery you get to run in. Fun! Look forward to hearing about the race! Best of luck to you! Goodluck!!! :) I would love to run that race. I hear a lot of good things about it. I have that race on my bucket list! Yay! So excited for you!! Looks like training has gone great for you!